1969 Chevy Camaro SS Tribute 12 Bolt PosiJust in time for the Summer!350 High Performance Motor Check Out The Video Below! If you have been searching for a 1969 Camaro SS in this Beautiful color combo in perfect driver quality condition, then please pay careful attention to the details of this eBay No Reserve Once in a Lifetime Event. History. The Chevrolet Camaro is an automobile manufactured by General Motors under the Chevrolet brand, classified as a pony car, and some versions also as a muscle car. It went on sale on September 29, 1966, for the 1967 model year and was designed as a competing model to the Ford Mustang. The car shared its platform and major components with the Pontiac Firebird, also introduced for 1967. First-generation Camaro debuted on a new rear-wheel drive GM F-body platform and would be available as a 2-door, 2+2 seating, coupé or convertible with a choice of 250ci inline-6 and 302ci, 307ci, 327ci, 350ci, or 396ci V8 powerplants. The Camaro was touted as having the same conventional rear-drive, front-engine configuration as Mustang and Chevy Nova. In addition, the Camaro was designed to fit a variety of power plants in the engine bay. 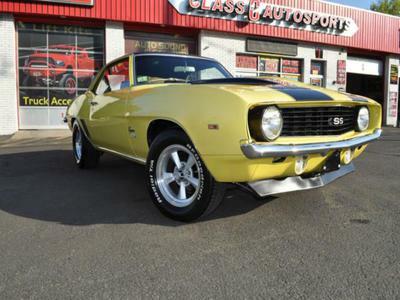 The first-generation Camaro would last until the 1969 model year.This 69 SS Tribute is one extremely rare highly desirable investment quality classic. Details. The Paint Shines Great on this laser Straight Driver Quality body. The Black Vinyl Top is in good condition and looks great along with the Black Stripes as this was an older restoration but this 69&apos; Camaro still shows beautifully. It has a 350 High Performance Motor & Automatic Trans. 12 Bolt Posi Rear, Power Steering, & Power Disc Brakes! All the suspension components are brand new as the car steers very tight and is very responsive. This Camaro is truly one of a kind as it can be driven from coast to coast without a problem! The title states actual mileage which is under 30k Miles! The interior is in good driver quality condition and has new front door panels. This Car has a factory center console & gauges as well as a set of Brand New Ridler polished wheels with BFGoodrich White Letter Tires. The chrome bumpers shine great and the chrome mirrors and chrome door handles are brand new. Under the Hood.350 High Performance Motor along with a Automatic Transmission. It has a brand new Edelbrock Intake Manifold and a Brand New Edelbrock Engine Dress Up Kit. All the suspension components are brand new including the front & rear Bushings, Shocks, & Springs. 12 Bolt Posi Rear as well as Power Steering and New Front Disc Power Brakes! The car handles like a new car and can be driven any distance without any problems! New High Performance Headers leading up to a Custom Dual High Performance Exhaust System that looks and sounds just as mean as a true american muscle car should sound (watch video below). The car drives great and sounds amazing. The Options.350 High Performance Motor w/ Automatic Trans 30, 000 Original Miles as stated on Title! 12 Bolt Posi Rear New Polyurethane Bushings New Front and Rear Suspension including the shocks & springs Handles & Steers Very Tight & Responsive! New Front Disc Power Brakes Power Steering Factory Center Console & Gauges New Ridler Polished wheels w/ BFGoodrich White Letter Tires! Clean Trunk Brand New Edelbrock Intake Manifold Brand New Edelbrock Engine Dress Up Kit New Chrome Mirrors & Door Handles! Custom High Performance Headers Custom Dual High Performance Exhaust that sounds great! Cars Runs and Drives like a modern car & can be driven long distances or even be used as a daily driver! This is the perfect summer cruiser! This 69 Camaro SS Tribute is as good as it gets, as it runs and drives just like a modern car. This car is not show quality but definitely driver quality and one of a kind as it would make a great daily driver. If you have been searching for a 1969 Camaro SS that drives as good as it looks, this is the car for you. 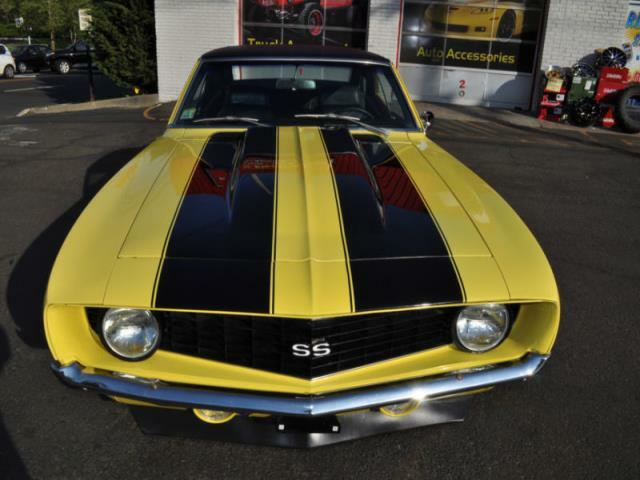 This is the perfect Camaro for anyone who has ever dreamed of owning and enjoying an Iconic rapidly appreciating & arguably the best investment year classic Camaro of all time.